Born May 3, 1968 (age 47) (1968-05-03) Flushing, Queens, New York City, U.S.
Amy Ryan (born May 3, 1968) is an American actress of stage and screen. A graduate of New York's High School of Performing Arts, she is an Academy Award nominee and two-time Tony Award nominee. Ryan began her professional stage career in 1987 and made her Broadway debut in 1993 as a replacement in the original production of The Sisters Rosensweig. She went on to receive Tony Award nominations for Best Featured Actress in a Play for the 2000 revival of Uncle Vanya and the 2005 revival of A Streetcar Named Desire. She was nominated for an Academy Award for Best Supporting Actress for her performance as Helene McCready in the 2007 film Gone Baby Gone. The role also earned her a Golden Globe nomination and won her a Critics' Choice Award. Her other films include Changeling (2008), Win Win (2011) and Birdman (2014). On television, she played Beadie Russell in HBO's The Wire (2002–08), Holly Flax in NBC's The Office (2008–11) and Adele Brousse in HBO's In Treatment (2010). Ryan was born Amy Beth Dziewiontkowski in Flushing, Queens, New York City, to Pamela (nee Ryan), a nurse, and John Dziewiontkowski, a trucking business owner. She is of Polish, Irish, and English descent. Growing up in the 1970s, Ryan and her sister Laura delivered the Daily News by bike. At a young age, Ryan attended the Stagedoor Manor Performing Arts Center in upstate New York. At 17, she graduated from New York's High School of Performing Arts. Hired for the national tour of Biloxi Blues right out of high school, Ryan worked steadily off-Broadway for the next decade. She chose her mother's maiden name as her stage name. Ryan made her off-Broadway debut in the Westside Theatre's 1987 production of A Shayna Maidel, playing the role of Hanna. The following year she was seen in the Second Stage Theatre Company's revival of The Rimers of Eldritch. Additional off-Broadway credits include As Bees In Honey Drown, Crimes of the Heart and Saved. She also worked in regional theater, where she originated roles in new plays by Neil LaBute, Arthur Miller and Neil Simon. On Broadway she has appeared as Tess in The Sisters Rosensweig, Natasha in the 1997 revival of The Three Sisters, and Peggy in the 2001–2002 revival of The Women. Ryan was nominated for the Tony Award for Best Performance by a Featured Actress in a Play twice: in 2000, for her portrayal of Sonya Alexandrovna in Uncle Vanya, and in 2005, for her performance as Stella Kowalski opposite John C. Reilly in A Streetcar Named Desire. Following a brief stint playing a runaway on As the World Turns, Ryan was cast in television series such as I'll Fly Away, in which she played a high school temptress, and Brooklyn Bridge, where she played Marion Ross's character in flashbacks. After roles on ER and Chicago Hope, Ryan became a series regular on The Naked Truth as Tea Leoni's spoiled stepdaughter. In 1993, she made her first appearance on NBC's Law & Order, appearing in several episodes over the years. By 2001, director Sidney Lumet cast her in 100 Centre Street playing three different roles (Ellen, Paris and Rebecca). Ryan went on to feature prominently in the second season of HBO's The Wire, playing Port Authority Officer Beadie Russell. 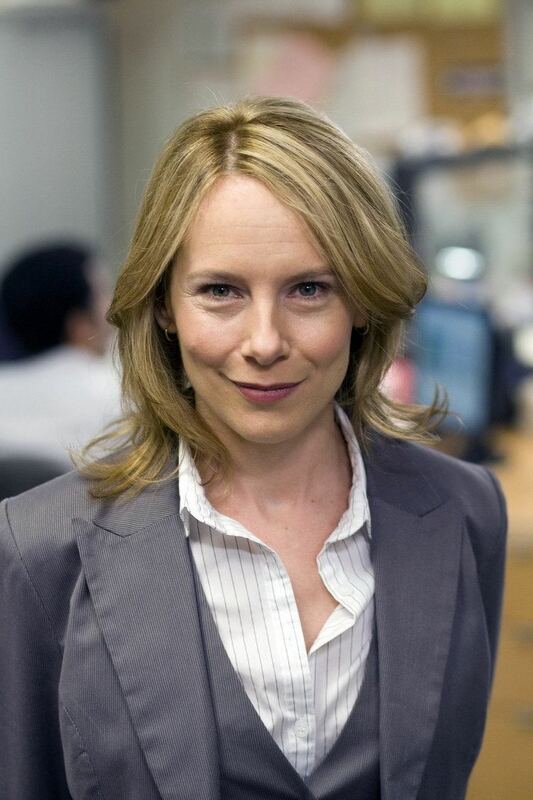 She appeared for a six-episode arc on The Office as dorky HR rep Holly Flax. She reprised her role on The Office in seasons 5 and 7. Ryan joined the cast of HBO's In Treatment for its third season, playing the therapist of Dr. Paul Weston. Because of the deletion of the scene where she played Eric Stoltz's wife in Allison Anders's Grace of My Heart, Ryan made her 1999 film debut in Roberta. She then briefly appeared in You Can Count on Me, which starred Laura Linney and Mark Ruffalo, and the mystery/thriller Keane. Albert Brooks chose her to play his wife in Looking for Comedy in the Muslim World in 2005, and 2007 brought both Dan in Real Life and Before the Devil Knows You're Dead. Her role as a star-struck sheriff's wife in Capote earned her positive reviews, but it was playing a hardened welfare mom in Ben Affleck's Gone Baby Gone that finally brought her national attention. After being voted Best Supporting Actress for Gone Baby Gone by the National Board of Review, as well as the critics circles in New York, Los Angeles, Boston, San Francisco and Washington, D.C., Ryan's performance was also nominated for a Golden Globe Award, a Screen Actors Guild Award, and an Oscar for Best Performance by an Actress in a Supporting role at the 80th Academy Awards. Ryan appeared in Changeling (2008), directed by Clint Eastwood, and opposite Matt Damon in Paul Greengrass's Green Zone (2010). In September 2010, she completed filming a role in Philip Seymour Hoffman's directorial film debut, Jack Goes Boating, taking over the role of Connie originally played by Beth Cole in the stage version. Ryan is set to star in Paramount's live-action and animated film, Monster Trucks. In 2015, Ryan starred as Tom Hank's wife in the film Bridge of Spies. Ryan married Eric Slovin in 2011. They have one daughter, Georgia Gracie (born October 15, 2009).